Small, compact and flexible that produces up to 100 pouches per minute. The high speed compact horizontal packaging machine is small and flexible. 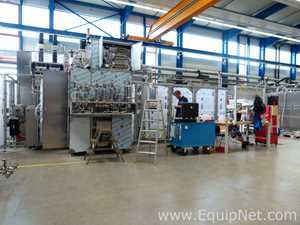 This HFFS machine is remarkable for its versatility, high efficiency and low cost. Suitable for both single or stringed sachets, it can incorporate a wide range of accessories as date coders, notches, hole punchers, towelette fillers, etc. Thanks to its design, it allows to mount a variety of different types of fillers, cup fillers for granules or free flowing product, auger fillers for powders or pump fillers for liquid or viscous products. This high speed compact horizontal packaging machine, as well as the rest of the range, has a separate electrical panel as well as the rest of the range. Mespack uses Omron as standard, however, models from Siemens or Allan Bradley can be adapted. By unifying the vast majority of its components with those of the rest of range, the after-sales service is faster and more efficient.